Sustainability managers should not try to reinvent the wheel when it comes to creating new programs but rather look to Not for Profits that are already doing a good job and partner with them to build their capacity to deliver effective programs, says Katarina Persic, public affairs manager at Toyota Australia. OPINION: Sustainability managers should not try to reinvent the wheel when it comes to creating new programs but rather look to Not for Profits that are already doing a good job and partner with them to build their capacity to deliver effective programs, says Katarina Persic, public affairs manager at Toyota Australia. For many years I grappled with the boundaries that you can or must put around Corporate Philanthropy/ Community investment and how to explain how Toyota makes decisions and explains itself to people not involved in the philanthropy industry. There are many types of philanthropy – all are legitimate – they just have different aims and constraints. However, Corporate Philanthropy/ Community investment is unique. 1. Licence to Operate (local community – however you define your local community). As the Toyota Australia plant is located in the city of Hobson’s Bay we work alongside the local council in the area. 2. Employees – Toyota employees must see their employer as a good corporate citizen and the corporate giving must relate to the employee somehow eg. workplace giving gives an employee individual choice. After observation and learning over many years I developed my own model that makes sense to me and makes sense when I explain it to Toyota Australia stakeholders and others. Toyota Australia has designed a model of philanthropy that is based on this design. It sets boundaries and makes it clear to all stakeholders why Toyota Australia gives and why it gives. Don't reinvent the wheel and create new programs in these areas – find Not for Profits that are already doing a good job and partner with them to build their capacity to deliver effective programs. Partnerships contracts are created with key kpis with the chosen nfp and a mutual relationship is developed on respect and no surprises. Employees want to know that Toyota contributes to the community. Corporate philanthropy is talked about when there are disasters and employees expect – as they rightly should, that their company will contribute. Toyota Australia has developed a Disaster Relief Policy and matched giving for this. Individual workplace giving has also been introduced to give employees a private choice of what charity they want to support. An employee might not care/relate to the company areas of enviro, traffic safety, education but feel good knowing that they can give to their charity of choice relating to their personal interest. Toyota Japan also says that each Toyota factory must contribute to their local community in the way that they believe is appropriate for their circumstance. Toyota will contribute to the Councils directly adding to their local community grants funds – Local Councils are the closest to the community, the know the community groups well. Using Councils grants process the Toyota Employee champions will be able to read all the applications and be guided in grant giving by the Council. This also helps Toyota maintain a conversation with councils as an important stakeholder. We don't offer volunteering – (as it’s too hard to take people off a production line) so we instead acknowledge what employees do in their local community and have instigated Employee volunteering grants. 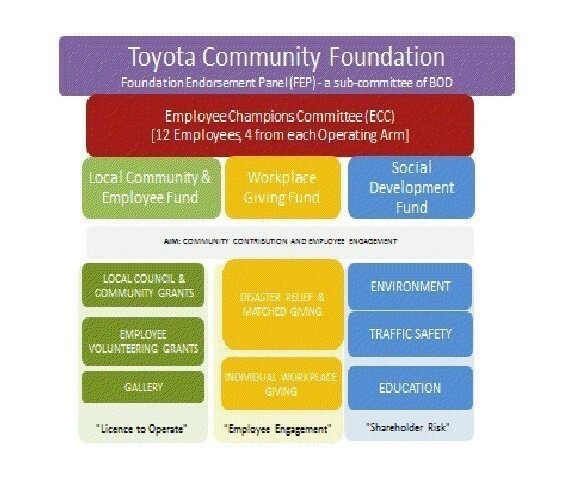 If an employee demonstrates they are active in a local community group they are then the organisation is eligible to receive a grant from Toyota. A program we have at our Head Office in Port Melbourne encourages artists from across Australia to display their work. Over 850 artists have done so and we invite the community in to view the work like a gallery. Most important part – 12 employees chosen across the company to help/guide and shape the Foundation and its programs. The employees present to the Directors two times a year. This is a really important development opportunity. The Foundation was approved in Oct 2010 – with full roll out expected by April 2013. About the author: Katarina Persic has worked in the Not for Profit, government and corporate sectors. She was Program Manager for 3MBS-FM, a classical Music radio station based in Melbourne and Manager Arts, Events and Tourism for Hobsons Bay City Council where she initiated an overarching culture policy for the organisation. Persic is currently studying for a Master of Social Investment and Philanthropy at Swinburne University. She has lead Toyota Australia’s corporate philanthropy/ community investment policy and program development during the last six years. There is another model. Our charity seeks to give money to private business to help spread our message. We dont ask for money we give it to you.Recently we donated a large some of money to a national bank to help promote our message. Currently we allowing a national sign writing franchise to make money from our charity without asking for any money in return. Think outside the square. We would be a perfect fit for Toyota. How much money and publicity would you like? Happy to hear your pitch Max. Please contact me.